Custom brochure printing with us at UPrinting is easy and fast. From our easy-to-navigate website and design tool to printing and delivery. 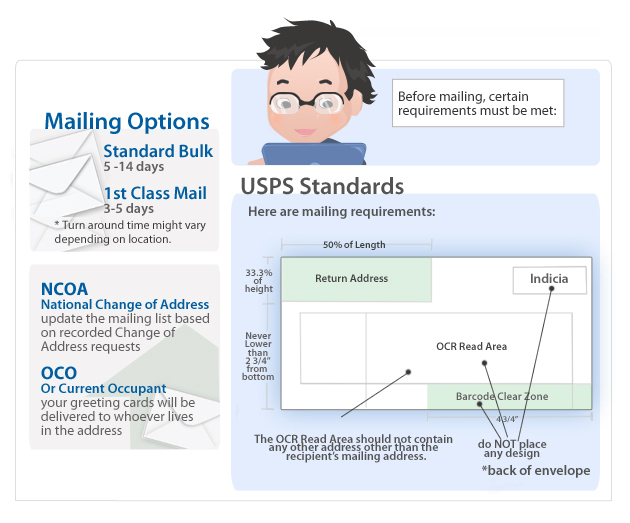 We even offer brochure mailing for those of you who would want to take advantage of direct mailing. Imagine distributing your own custom brochures without the hassles of doing everything yourself. It's almost like lifting your finger until you remember that you don't really have to. In fact, we also provide brochure design services for those who neither have the time nor the resources. In between the start and finish is our customer service. Experience it like you never will from other printing companies. We have representatives who are ready to help you through voice and chat 24 hours a day from Mondays to Fridays. We are even open on Saturdays and Sundays from 9am - 6pm PST! Aside from that, we even offer free digital proof, even before you pay. That's not all, you get one even without any order commitment. 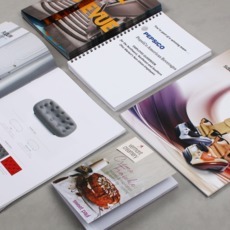 You even have lots of brochure design and mailing options ahead of you! Brochure folding is in itself a great design opportunity. There are stories best told in one way and there are those that are effectively delivered in another. 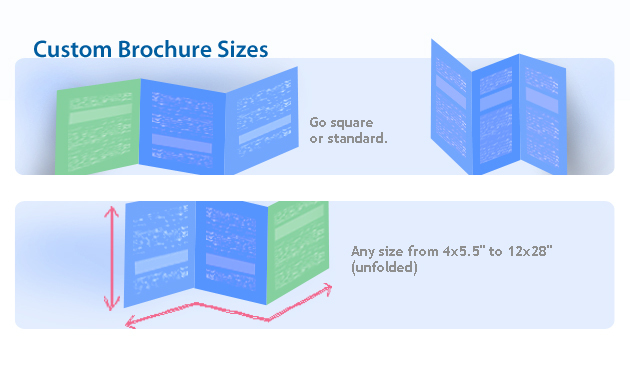 Deliver yours by choosing the best folding option that will fit your brochure content and design. We offer standard folding as you will see below. You have just seen our standard folding options, but wait! We also do custom folding. 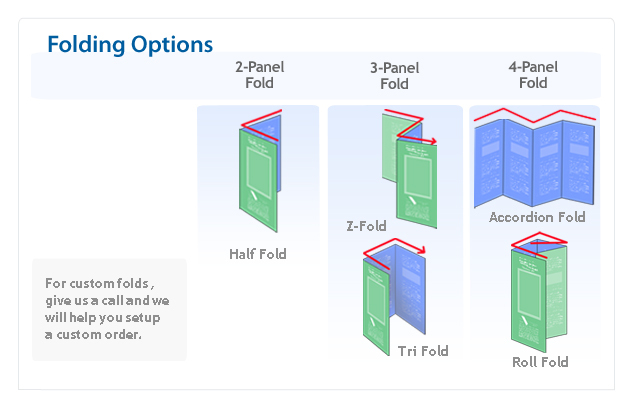 Just talk or chat with us for more folding possibilities. You may contact us through the link and information at the top of the page. These sizes are based on unfolded brochures. That means that the size of the folded finished product will depend on how many folds you choose to have. Thus, if you choose 8.5" x 14", the finished product will be 8.5" x 4.66". Mailing your brochures? You could also choose between tabbing and inserting yours inside envelopes. After receiving the file from you, our pre-press department will check your file for print-readiness. If there are minor discrepancies or errors, they will correct it and attach a proof on your account for your approval. You will be notified through email and the proof shall contain a personalized note on what the errors were, if any. Upon your approval and payment, we will start your brochure printing project. We will also do the coating and other finishing that you have required upon ordering. These include: folding and matte or gloss coating. After the printing and custom finishing process, we will verify the mailing list you will have had uploaded. Afterward, we will print the envelopes with individual mailing addresses and start sending them out according to the options you choose. These options are as follow: Please take note that the turn around time is directly proportional to location. The smaller the area, the faster the turn around time. Same applies to larger areas. Please take note that there may be delays due to unforeseen events that are beyond human control, such as adverse weather. Getting Started Custom brochure printing definitely is customizable here with us at UPrinting! And it is very easy, too. To get started, just click here.